Heat oil in a frying pan over medium heat and cook bacon for 1-2 minutes on each side or until crisp and golden. Whisk eggs, milk and sugar & vanilla extract in a shallow dish. Heat a frying pan over medium heat, add half the butter and 1 tbs oil. Dip bread, 1 slice at a time, into egg mixture and turn to coat. Allow excess to drain. Cook for 3 minutes each side or until golden, adding remaining butter and oil as required. 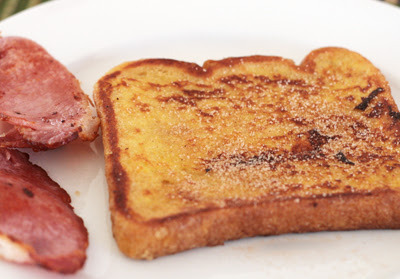 Arrange the toast on a serving plate top with the bacon and drizzle with maple syrup to serve.